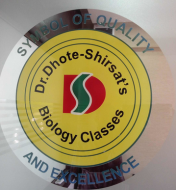 Dr dhote shirsats Biology Classes,we provides Class XI-XII Tuition (PUC),NEET-UG Coaching Classes,Quantitative Aptitude Coaching,Medical Entrance Coaching classes to all. Dr Dhote shirsats Classes conducts classes in Medical Entrance Coaching and NEET-UG Coaching. It is located in Nanded Town, Nanded. It takes Regular Classes- at the Institute.